You can add bookmarks to indicate points of interest in a video or audio clip. Bookmarks can be used to trigger animations or to mark a specific location to jump to in a video. Bookmarks can also be helpful while you deliver a presentation, when you need to find specific points in a video or audio clip quickly. 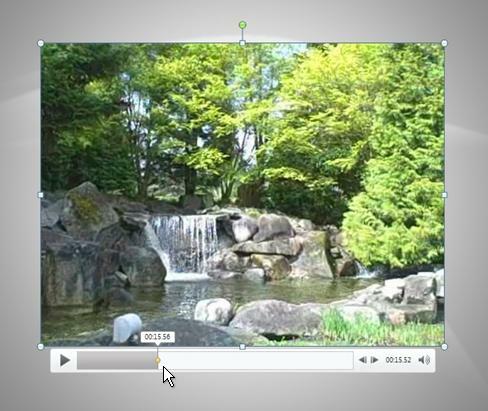 Here is an example of a bookmark that shows where to trim the beginning of a video clip. Here is a bookmark that shows where to trim the beginning of an audio clip. On the slide, click the video or audio clip. In the audio or video controls below the clip, click Play. When you reach the point where you want to make the cut, click Pause. Video clip: Under Video Tools, on the Playback tab, in the Bookmarks group, click Add Bookmark. Audio clip: Under Audio Tools, on the Playback tab, in the Bookmarks group, click Add Bookmark. In the time line, locate and click the bookmark that you want to remove. Video clip: Under Video Tools, on the Playback tab, in the Bookmarks group, click Remove Bookmark. Audio clip: Under Audio Tools, on the Playback tab, in the Bookmarks group, click Remove Bookmark.